Just as each person has a unique road to optimal health, each of us also face different challenges with our weight. Weight is a health concern and the larger our body, the longer our nerves and circulatory pathways have to stretch to reach our skin. The more tired we are and the less motivated we feel. Weight is an issue that everyone in my family struggles with, so I know the frustration of eating healthy, exercising (kind of) and still gaining weight. But there is always a way and this is the only way that worked for me. I lost just over 20 pounds in one month and have kept it off. You can do the same regardless of anything else you have tried. So get started! Prepare for your weight loss journey by stocking up on healthy foods, measure and weigh yourself and keep a journal of your food, how you feel and motivational thoughts! If you are someone who has been exercising regularly but still can’t lose weight, there is an Active Lifestyle option to the calorie restriction approach. This is for people who will be continuing their exercise program and so can have more calories in their daily diet. In this way you can build muscle while losing fat! The first step is our new homeopathic weight loss program that uses a combination of detoxification and food restriction along with a completely natural, homeopathic Human Growth Hormone formula, proven to help weight loss. This program begins the first 7 days with the homeopathic weight loss kit which is continued throughout the entire program and for up to 60 days in total. During this time caffeine, sugar and starch should be gradually reduced. On the 8th and 9th day, fat-loading is the focus for the day and the magic hCG drops begin. This helps the body prepare for extreme calorie-restriction and reduces hunger and craving tendencies. This may seem counterintuitive, but the extra calories consumed during these two days will provide the energy needed during the first few days of the 500-calorie diet while the hCG drops begin to take effect. For 21 days you will be following a 500 calorie daily restricted eating plan which includes 2 servings of fruits, 2 servings of vegetables, 2 servings of protein and unlimited salad. 64 ounces of water is the minimum requirement and aiming for 50% of your body weight in ounces per day is a great goal. This step can be extended to 40 days if you feel like continuing! If you have not regularly exercised, then don’t start now. Wait until your energy is better and you feel more motivated to jump into a routine. Focus is the key and keeping your focus on your food intake will give you optimal results. World-famous endocrinologist Dr. Albert T. W. Simeons first proposed the concept of a calorie-restricted diet along with doses of human chorionic gonadotrophin (hCG or human growth hormone) in 1954. Dr. Simeons observed that pregnant women in poverty-stricken countries, though underfed and malnourished themselves, would still give birth to normal, healthy babies. hCG, a hormone produced by women during pregnancy, mobilizes non-essential fat stores to provide energy to the developing child. This is an incredible approach that works for both men and women with no side effects and no bounce-back effect typical with restrictive weight loss programs. The human body contains three types of fat. Structural fat resides around joints and organs to provide protection and support. Normal or essential fat reserves are distributed evenly throughout the body and are used as a day-to-day source of energy. Structural and essential fat are both considered “normal.” The third type of fat is abnormal, secondary, or non-essential fat. This “obesity-causing” fat tends to accumulate around the hips, thighs, waist, stomach, and bum. These fat reserves are not released during normal diet and exercise but are retained as “emergency” reserves and usually only released during periods of low caloric intake. Dr. Simeons observed that obesity is nearly always accompanied by a depressed metabolism and a nearly constant state of hunger, which often includes intense cravings. This makes it very difficult to actually lose weight and Dr. Simeons discovered that the diencephalon—a primitive part of the brain responsible for the basic functions of the body such as breathing and the beating of the heart—also directs the storage and use of fat. He believed that reseting the diencephalon is key to accessing and releasing non-essential fat stores. This led to the development of the homeopathic formulas used in the Evoluation Weight Loss Program. Many people have dysregulated blood sugar because they skip meals, don’t get enough volume of food or have an undiagnosed blood sugar imbalance. This makes it very difficult to follow a calorie-restrictive weight loss program. 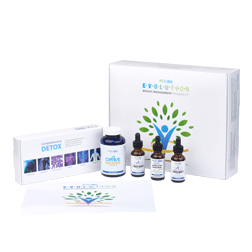 Beginning with this 10 day Blood Sugar Support Kit can make all the difference, improving energy, reducing symptoms such as headaches, dizziness or fatigue and give you the balance that you need to be successful at losing weight. Research has shown this program to improve blood sugar, A1C levels and reduce insulin resistance significantly. * Try to wait a while after eating before drinking so you don't interfere with the action of your digestive enzymes. Drinking beverages, even water, during eating reduces your stomach's digestive ability and can leave undigested food soaked in acid to enter the intestinal tract. This can cause irritation, inflammation, ulcers or even IBS. * Fruits and vegetables must be fresh and ripe to avoid naturally occuring biochemicals that happen as a fruit becomes over-ripe or hasn't yet become ripe, from interfering with healthy body processes. This is often the reason some people experience stomach aches or even diarrhea after eating fruit. * Citrus fruits neutralize pepsin, a necessary protein enzyme that can break down excessive protein residue. This reduces your ability to completely digest proteins. So do not blend a citrus fruit with a protein in a meal. * Fruits can help naturally cleanse your body by stimulating the kidneys and colon. * Milk products can produce mucous which can block your absorption. This is the cause of most mucoid plaque in the intestinal tract. Even after you do an intestinal cleanse, try to restrict your milk product intake. * Eating raw vegetables or salads late in the day can cause digestive distress. This is often the underlying cause of night-time acid reflux. * Sugars reduce your digestion of carbohydrates. For this reason it is a good idea to not mix fruit and vegetables at meals. Have one or the other so that you can digest both effectively. * Pineapple helps to break down fat and cholesterol in the food you eat making them easier for your body to utilize. * Strawberries break down both fat and carbohydrates in your meals. * Papaya, mango and kiwi break down protein. This is why many cultures eat one of these as a dessert after eating a protein meal. * Raisins and prunes break down carbohydrates. Ever wonder why prunes help constipation? It's because most constipation is caused by undigested food trapped in the gut. Depending on your diet this can often be lots and lots of carbohydrates that didn't have enough inherent fiber to mobilize them through the digestive tract or that overwhelmed the amount of digestive enzymes that you produce. * Grapes break down excess sugar in the body. This makes grapes excellent for hypoglycemia. * Cherries reduce excess stored calcium. In many early texts, cherry juice was used for gout, arthritis, bone spurs and gallstones. * Watermelon reduces water retention and salt.